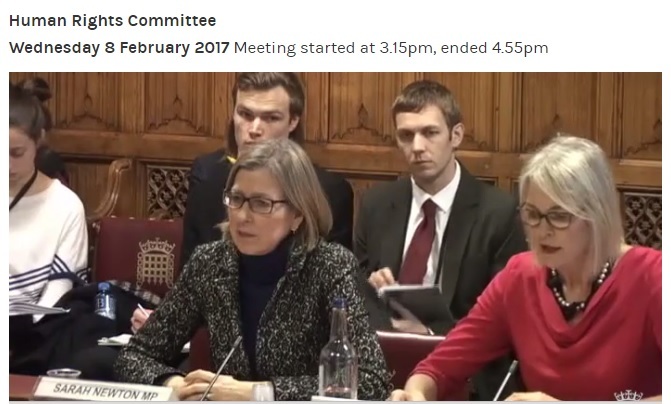 Tuning into last Wednesday’s JCHR Business & Human Rights evidence session, I watched Fiona Bruce MP question BEIS Minister Margot James about the effectiveness of the UK National Contact Point for the OECD guidelines, in resolving complaints arising from alleged corporate abuses. The Committee moved on to question Sarah Newton MP from the Home Office about modern slavery. Then it was back to Margot James for a question on human rights standards in post-Brexit trade deals (she’s supportive of maintaining them, but couldn’t confirm HMG’s position), before she and Sarah Newton left, doing a relay-style handover with FCO Minister Baroness Anerley and Sir Oliver Heald MP, Minister of State for Courts and Justice. “I saw you on the screen,” Committee Chair Harriet Harman said to Baroness Anerley as she took her seat (all the committee rooms have TVs showing the main debates), “so I know you’ve hot-footed it from the Chamber.” Whether a ministerial baton pass took place may never be known, but the Committee was only just warming up. As questions covering civil law, criminal law, employment tribunals, UK embassies work with human rights defenders and more were piled on, my tweets started to lag behind, their tiny feathers weighed down with acronyms – BHR NAPs etc. – and phrases like, “the proportionality test under the Rome II regulation”. At the end of it all, I found myself sympathetic to the Committee’s somewhat incoherent questioning. That sounds like a criticism, but it isn’t intended as one. The session simply reflected the UK government’s approach to business and human rights. Yes, there’s an action plan, but it isn’t underpinned by a broader strategy, resulting in BHR pick ’n’ mix, with government selecting particular topics and projects seemingly at random when what’s really needed is a holistic approach. In our written submission to the inquiry, we called for the government to develop a proper strategy on business and human rights. In the session that I gave evidence to, Lord Henley asked whether there should be a central coordinating role based in the Cabinet Office. As the issues cut across almost every government department, such an approach would be the obvious and most efficient way to improve coordination. We hope that the Committee includes this as one of its recommendations. Below are the main highlights (and lowlights) from Wednesday’s meeting. “We’re determined to do everything possible to make this work”, Home Office minister Sarah Newton said in response to questions about the supply chain reporting requirement in the Modern Slavery Act. Newton confirmed that the Home Office is working with HMRC to develop a list of companies covered by the law, indicating a welcome change in the government’s approach. Yet in a recent parliamentary answer, she stated that there were no plans to publish such a list, suggesting a conflicted and changeable position. The Committee pressed both sets of witnesses on access to remedy for victims of corporate malpractice. Fiona Bruce expressed concerns about the level of resources in the UK NCP (the JCHR visited them last year), while other committee members grilled Oliver Heald on barriers to justice in the UK courts faced by overseas claimants, and the possibility of criminal law reform to hold companies to account. The answers were disappointingly familiar, with ministers refusing to acknowledge the problems. No surprise there. Six years into the endorsement of the UNGP’s, the UK government is far from alone in failing to recognise its duty to take action to provide access to remedy. Apart from modern slavery, the government still seems to view BHR policy as something that’s implemented in other countries. The FCO’s work with human rights defenders in Colombia and elsewhere is of course valuable, but the government must recognise that if it is to deliver on the Prime Minister’s commitment to crack down on irresponsible business, more needs to be done to improve the conduct of British companies abroad. The simplest and most effective way to achieve this would be to require large firms to conduct human rights due diligence throughout their operations. Ministers usually give evidence towards the end of committee inquiries and the JCHR started this one in June, so we may see the report fairly soon. Our hope is that the recommendations outlined reflect and accelerate growing calls for responsible business at home and abroad.